I have said it after a toddler has refused to clean up and says something like, “I’m NOT cleaning up! You clean it up!” with the stubbornness and attitude that only a “terrible 2” can exhibit. I have said it to 8 year-olds when they are yelling at their siblings. I have said it to teenagers and tweens when they are demanding that life is not fair and they should be allowed to do whatever it is that I have just said “no” to. I haven’t said it at the supermarket when I have heard a father snapping and swearing at his kids for touching all of the cereal boxes. I haven’t said it on the bus when I have heard a mom angrily telling her preschooler to “shut up”. I haven’t said it to teachers who are fed up and yell at their classroom of middle schoolers who are acting up. And I haven’t said to to myself when I have had a bad day and snap unnecessarily at the people I love. But maybe I should. The question of “who are you talking to like that?” is a good one and it’s one that we as adults need to remember to ask of ourselves too. Children are tough. They are going to push buttons, they are going to act out, they are going to explore the world at times when you don’t have time or don’t want them to do it (e.g. checking out all the cereal boxes at the supermarket). But we need to check ourselves, continuously. How are we speaking to our children and to other members in the family? 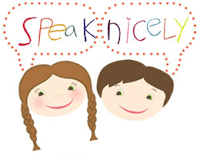 Would we want our children or other people talking to us the way we are talking to them? Probably not. A mom at meeting today said, “sometimes, as parents, we just flip our lid.” She continued to talk about how she tries to remember to speak positively to her children even when she is the most frustrated. She mentioned that she has a sheet of nice phrases to say to your child; things like, “you are fantastic” or “nice job!”. She said she puts that sheet on her refrigerator to help her to remember to speak nicely to her children both when she is “flipping her lid” and when she she is not. This post is a reminder to speak nicely. Especially to our children, and especially at the times when they really are pushing our buttons.